Have you seen the new stamp line by Julie Nutting? Prima Marketing is offering her newest stamp line and I was fortunate enough to get to play with some of the stamps. These stamps are really large - about 8-9" tall. They are so much fun to design with. I made four of these large tags adorned with these cuties. This is the first one and the tag has already been attached to a birthday gift I gave last week to my "purple diva" friend. 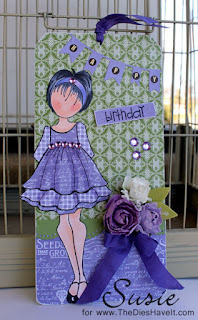 The papers I used are all from the Graphic 45 Secret Garden collection which all have a nice small scale to complement the large scale of the doll. I hope you like today's tag. I'll be sharing the others later in the month. Be sure to come back tomorrow because I have a super fun post to share with you. Susie, your creativity is just smashing! Love the vibrant colour and the wonderful paper piecing! Have a beautiful day! OMG Susie... Super Fabby Tag! Love the color you used is one of my fav color. GREAT JOB!